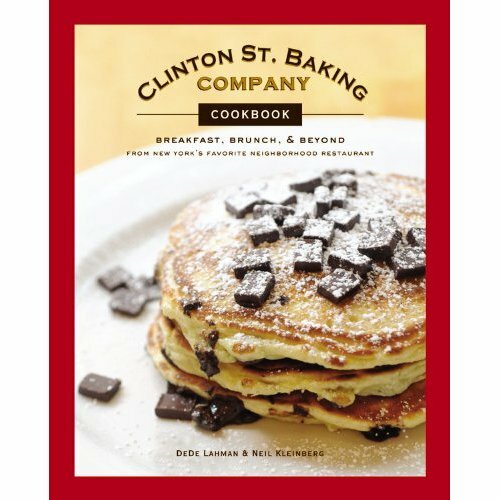 A friend recently celebrated a birthday and I decided to treat her by sharing a breakfast together at the birthplace for our new cookbook obsession: The Clinton Street Baking Company Cookbook. There has been quite a bit of buzz about this small lower East Side restaurant and bakery since husband & wife team, Neil Kleinberg and DeDe Lahman, opened in April 2001. Their mission was to make the best baked goods in the city, hand-mixed in small batches, using quality ingredients such as cage free eggs. Soon large crowds were lining up for breakfast, lunch and dinner. Their cookbook was named one of the best new cookbooks for 2010 by the New York Times (read article at this link). Both the pancakes and the buttermilk biscuits were on our mind as we've heard so much about them. The Clinton Street Baking Company and Restaurant is located at 4 Clinton Street (between East Houston and Stanton), New York, NY. The Lower East Side is a trendy yet rough and tumble neighborhood of old time tenement buildings and stores as you can see from a previous post I did about the neighborhood at this link. It may not be where you'd expect to find what was rated as the "best breakfast/brunch" spot by Time Out Magazine or the "best pancakes' by New York Magazine, among other honors which you can read about on this link. The menu offered many tempting breakfasts, as you can see if you double click on the photo above to enlarge it. I really couldn't get a photo of the inside, as we were seated almost elbow to elbow in the small 32 seat restaurant, and I didn't want to annoy the diners at that table. None of that mattered when our breakfast was served! I chose the "Country Breakfast" of three eggs, grilled "cure 81" ham steak hash browns and a buttermilk biscuit. I had especially wanted to try the buttermilk biscuit as they were modeled after the ones that were served in the once legendary seafood restaurant from my youth called Lundy's. That restaurant has been sadly closed for many years so it was nice to taste their wonderful biscuit again. Martha Stewart has called Neil "The king of buttermilk biscuits," and she is right! My biscuit was flaky, tender, "melt in the mouth" good! The entire delicious breakfast was so large that the only thing I ate for the rest of the day was a small bowl of soup for supper. Martha Stewart was kind enough to include the Buttermilk Biscuit recipe on her website, and there is also video to view of her and Neil making the biscuits on her show, which you can see at this link. My friend had the pancakes served with warm maple butter. She could have had wild Maine blueberry, banana walnut or chocolate chunk pancakes for the same price, but we both had decided we wanted to try them plain, so as to really see if we liked the basic pancake recipe in the cookbook. They were served with a raspberry jam on the side which was wonderful! Neil whips the egg whites separately from the yolks and then folds them slowly into the batter in increments when he makes his pancakes, which makes them extra light and fluffy. Again, he demonstrated cooking his pancakes on the Martha Stewart show and you can see the video and get the pancake recipe at this link. Over 600 pancake stacks are served a week in this little restaurant so you know that they must be good! Of course, as a bakery, they also have cake and pies, pastries and muffins, cookies and biscuits for sale which you can see listed at this link. All are available for pick-up only, and most must be ordered 48 hours in advance. We enjoyed our breakfast celebration so much that I think we'll be making a trip back to the Lower East Side and the Clinton Street Bakery and Restaurant very soon! I'm linking this post to Jenny Matlock's Alphabe Thursday for this week's letter "Y" and I took the liberty of linking this post for Yummy, Yolks and Yes, those were wonderful biscuits and pancakes! 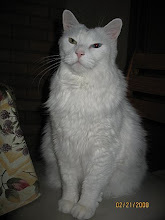 I'm also linking to Michael Lee's "Foodie Friday" on her blog Designs By Gollum and Sandi's Friday's Favorites on her blog Whistlestop Cafe Cooking. Thanks to all the hostesses! This home in the Mill Basin neighborhood in Brooklyn, New York, has been in the local news quite a bit lately. I won't go into the whole sordid affair of why the people living in this house have been making headlines, but suffice it to say it is sometimes true that real life, factual events can have more twists and turns than the most unbelievable works of fiction. Reading about these recent events made me desire to pay the Mill Basin neighborhood a visit and to take a walking tour of the neighborhood. Mill Basin was named after the many tide mills that were once located in the tidal marsh lands in the area. Situated along Jamaica Bay, Mill Basin was called Equandito (broken land) by the local Canarsee Indians, who sold the land to developers in 1664. It became part of Flatlands, and remained a rural area until 1890, when a lead-smelting plant was built in the area. The other main industry was fishing for the crabs, oysters and clams that lived in Jamaica Bay. Around 1909 the ill effects of heavy industry resulted in the filling of the marsh land, and after World War II, development companies bought up the land and residential development began. Today, Mill Basin is an exclusive residential neighborhood known for its expensive and luxurious homes. The houses are probably the type that most would not expect to find within city limits, and especially in Brooklyn, but as I have showed on previous posts about the Brooklyn Heights, Bay Ridge and Victorian Flatbush neighborhoods, Brooklyn has many upscale housing areas among it's more modest neighborhoods. Every time I visit Mill Basin -- or some also refer to it as Mill Island -- neighborhood, I am always astounded by the many newly built homes that have replaced older homes that I remember being there. ...and large, mostly three story homes replace them. As you can see in the photos above a smaller one story home is on the left and a newer replacement home is on the right. A fascinating statistic I saw at this link states that the average population density of a square mile in Brooklyn New York is 34,917 people per square mile, while in Mill Basin it is only 9,079 people per square mile. Although the homes may not have a property lot as large as homes in the suburbs, and are fairly close together, I am surprised that even that large a per capita ratio exists! 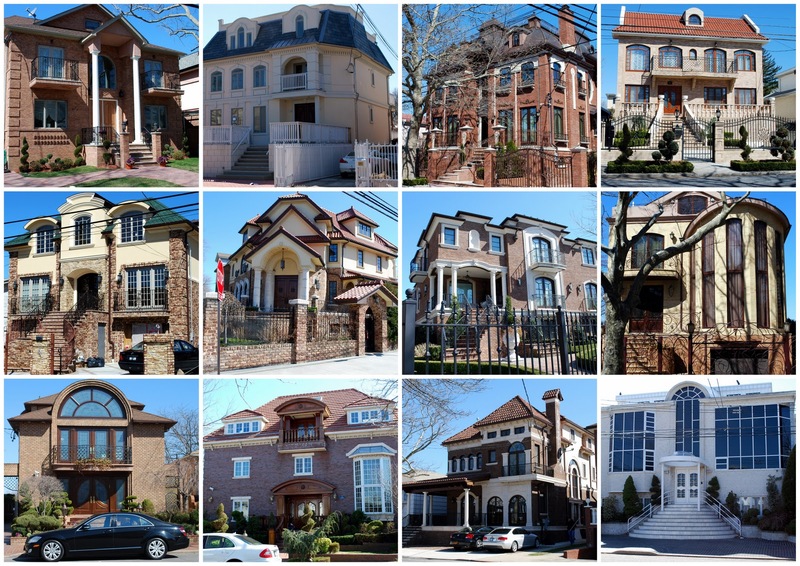 Mill Basin is an interesting neighborhood and another fascinating facet of Brooklyn, New York. I hope you enjoyed coming along with me for a virtual walk in this neighborhood. 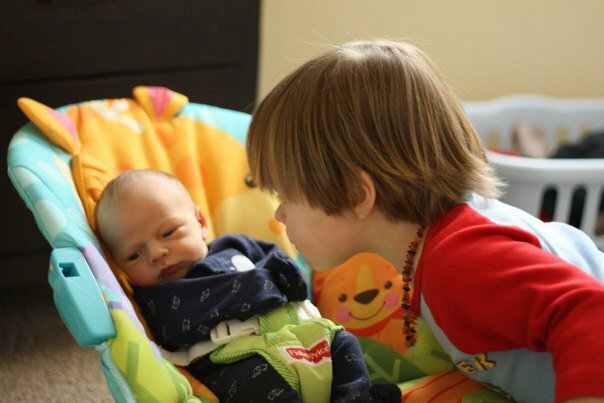 On a personal note, my grandsons have been bonding and "L" is having such a nice time being a big brother to his new brother "M." Thank you all for your congratulations and best wishes! I'm linking to "Mosaic Monday" on Mary's blog Little Red House Thanks Mary! 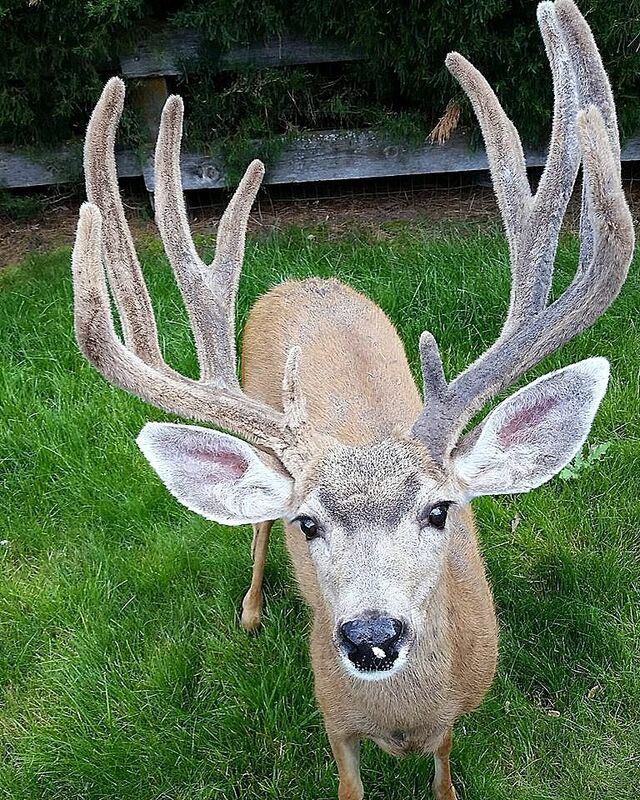 Click on the link to see many wonderful photo mosaics! Some more of my photos from the show.. In close proximity to the New York Botanical Gardens is Arthur Avenue in the Bronx, which is a wonderful area full of many old world Italian shops and restaurants. 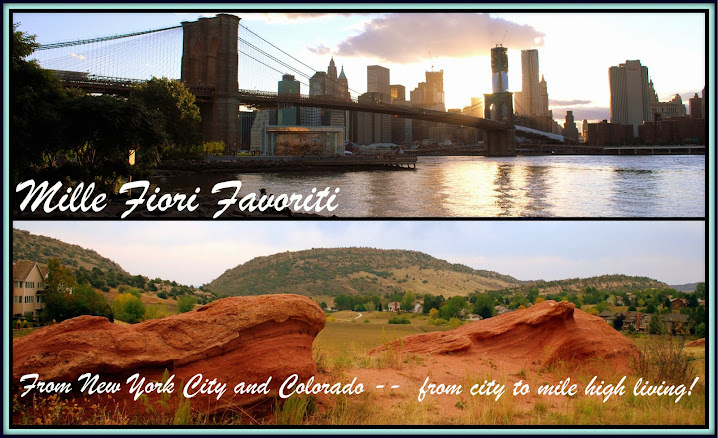 I did a few posts showing some of the delicious ethnic Italian specialties you can find there on which you can read on this link and this link. We stopped to make another visit after going to the gardens but because it was a Sunday not many establishments were open except for bread and pastry stores and restaurants. We decided to go into this pastry shop in the area with the pink awning for a special reason. Cafe Egidio located at E. 187th Street between Arthur Avenue and Hughes Avenue, in the Bronx, and established almost a hundred years ago, is well known for their authentic cookies and pastries. We wanted to buy special St. Joseph's pastries for the St. Joseph's Feast Day which has just passed on March 19, but the sign in the lower portion of the window for "Sanguinaccio" really caught my husband's eye with delight! I will leave it up to your imagination as to what sanguinaccio is, as it is not something everyone would find appetizing unless you grew up eating it. My husband's mother used to make this special sweet treat once a year, and he declared that Egidio's sanguinaccio was as good as his Mom's! A wonderful compliment to them. 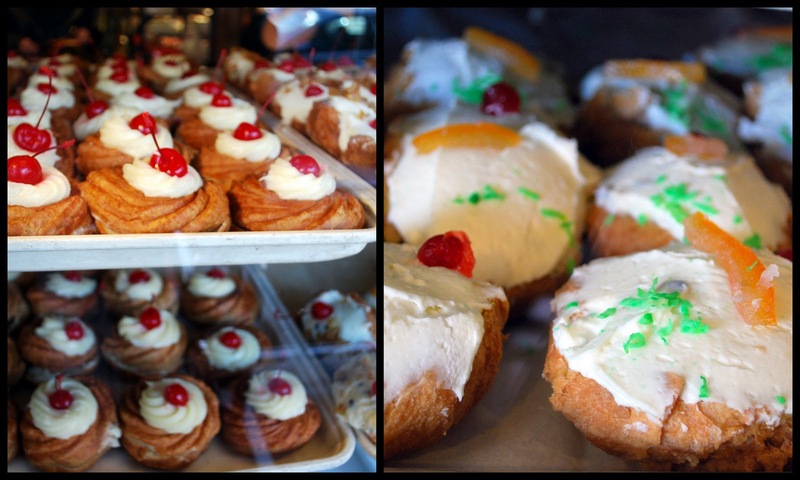 We did purchase a couple of the special St. Joseph's pastries to take home to enjoy later. On the left are Zeppole di San Giuseppe, which are fried dough, layered with a vanilla egg custard, then topped with a candied cherry on top, and on the right are Sfingi di San Giuseppe, which are reminiscent of a cream puff, and are filled with cannoli cream, chocolate chips and topped with a candied orange peel. I think it would be safe to say almost everyone would enjoy eating them...they are so good! Pink orchids and pastries ...who could ask for a better treat to welcome Spring? Thanks, Beverly for another wonderful Pink Satuday weekend! I would be remiss not to mark with special recognition the 100th Anniversary of the tragic Triangle Shirtwaist Factory fire that took place in this building located at the corner of Washington Place and Greene Street in the Greenwich Village neighborhood in Manhattan on March 25, 1911. This event caused the eventual transformation of the labor code of New York State and to the adoption of fire safety measures that served as a model for the whole country. The factory was located in the what was then the Asch Building, at 29 Washington Place, and now known as the Brown Building, part of New York University, and as you can see from the photo above, is located a block east from Washington Square Park. 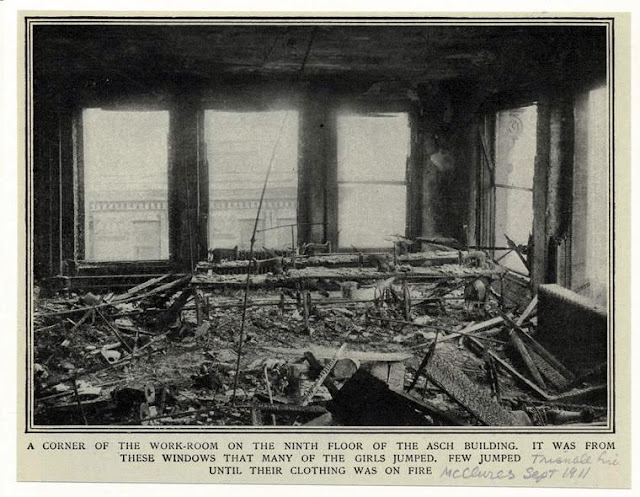 On Saturday, March 25, 1911, near closing time, a fire broke out at the Triangle Shirtwaist Factory and within a mere 18 minutes, 146 people were dead. Over six hundred people were crowded into the three upper floors of the building, working six to seven days a week under sweat shop conditions. Five hundred of the workers were young women and girls, the majority ages eleven to twenty three years old, mostly immigrants from Italy, Russia, Germany and Hungary. Most were the main wage earners for their struggling families. They were employees of the Triangle Shirtwaist Factory owned by Isaac Harris and Max Blanck. They worked long hours at their sewing machines making shirtwaist blouses which were popular fashion at the time. At approximately 4:45 PM a fire quickly flared up in a scrap bin under one of the cutter's tables at the northeast corner of the eighth floor, reportedly caused by an extinguished match or cigarette. Employees on the tenth floors were able to be notified of the fire by a bookkeeper by telephone but there was no way to send an alarm to the women on the ninth floor. 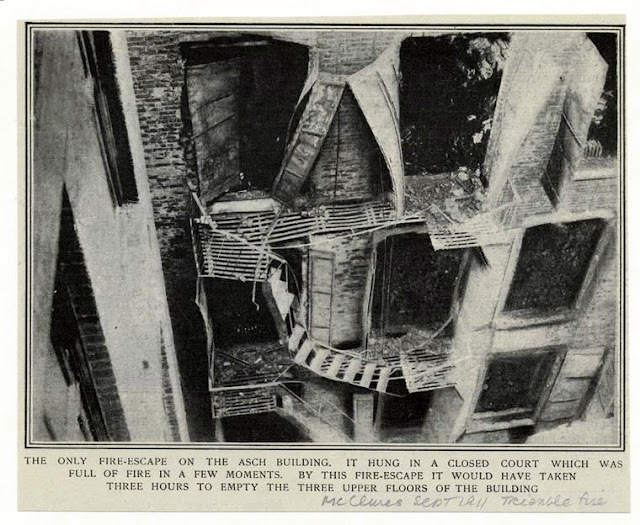 The fire department arrived within minutes but the fire truck ladders in that era only reached up to six floors. Photo source: NYPL Digital Collection direct link. To escape the fire the workers jammed into a small freight elevator which was able to make three complete trips, and onto the lone fire escape which soon twisted and collapsed from the heat and overload -- see photo above -- spilling victims nearly 100 feet to their deaths. Some workers escaped by running up the one open staircase on the Green Street side of the building to the roof, where they leaped onto an adjoining building, but that staircase soon filled up with fire and smoke and was impassable. The other factory door at Washington Place was locked. The owners had been trying to prevent theft and required each worker to pass inspection as they left work each day by one exit, and had ordered the other door locked. The employee who held the key to the locked door had already escaped the fire. The women on the ninth floor, who were unaware of the fire until the last minute, desperately tried all means of escape. Many squeezed into the last elevator that was able to make the ascent to the floor of the fire, and many jumped into the elevator shaft in an attempt to ride the elevator down on its roof but perished. The weight of those bodies prevented the elevator operator from making any more attempts to operate the elevator. The only way out for the trapped workers still alive on the ninth floor was to jump. A large crowd of bystanders, many who had been enjoying a pleasant spring day in the park, gathered on the street and with horror witnessed sixty-two people jumping or falling to their deaths from the burning building. Since so many jumped at once the firemens' nets were worthless and ripped as the bodies hit them. Photo Source; NYPL Digital Collection direct link. Those that did not jump were overcome with smoke and burned to death. Fifty bodies were recovered on the ninth floor, so badly burned that it was not until February 2011 that six of those victims were identified. Those six victims had been buried together in the Cemetery of the Evergreens in Brooklyn, New York. 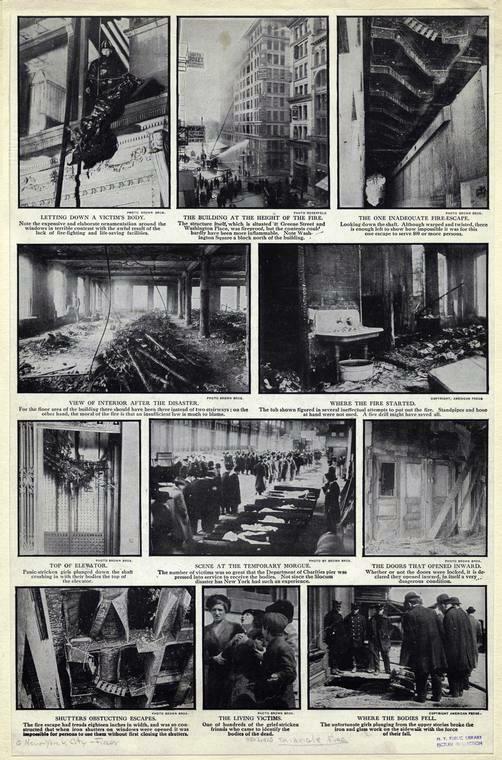 This montage from the New York Public Library digital collection shows of newspaper photos of the sad aftermath of the fire. Most of the public were outraged at the tragedy and there was a large turnout for the memorial service. Nearly 400,000 New Yorkers filled city streets to pay tribute to the victims and raise money to support their families. The ensuing public outrage forced government action. The Triangle Shirtwaist Fire helped to solidify support for workers' unions like the International Ladies' Garment Workers' Union. The owners, Isaac Harris and Max Blanck, were tried for manslaughter but were acquitted in 1914. The fire became a rallying cry for the international labor movement and many of our fire safety laws were created in response to this tragic event. Each year, Workers United sponsors a commemoration of those who died in the Triangle Fire. More information is available on their web site: Workers United. Several commemorations of the 100th anniversary of the Triangle Fire will take place in New York City and across the country. The Remember the Triangle Fire Coalition makes available an online listing of upcoming events. The ILR School Kheel Center, a division of Cornell University, has an extensive collection of material about the Triangle Fire and is worth exploring for information, names of the victims, photos and first hand accounts of the fire. There is also an excellent PBS Documentary about the Triangle Fire that you can watch in its entirety below or at this link. It is fitting to remember the young women and men who senselessly lost their lives that day. After the Triangle Fire tragedy, many work place reforms and fire safety laws have undoubtlessly saved many lives. It remains one of the worst fires this city has ever witnessed. I'm so pleased to announce that we have been blessed, and our second grandson "M" was born this morning to our son and daughter-in-law! Baby and mother are doing well, and we are all so excited and happy! 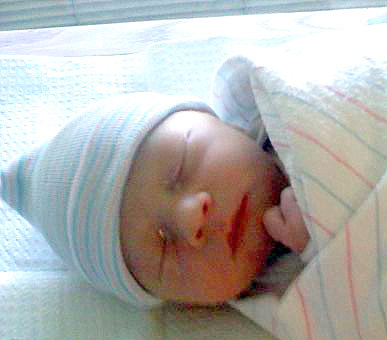 I'm sorry that all I have for now is cell phone photos that my daughter-in-law's sister sent to us from the hospital. She was there for the birth, along with my son, while my daughter-in-law's parents were babysitting my grandson "L." Little "L" is going to meet his brother in a little while...I'm sure he'll be so surprised! 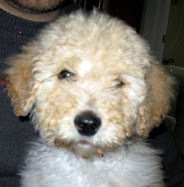 My husband and I can't wait to meet our new grandson very soon -- it's so hard living far away! I know I've been keeping all of you faithful readers in suspense the past few days and I wanted to let you know the good news as soon as possible. "M" was born rather late after his due date, and the anticipation was getting exhausting for us, but I guess he wanted to choose this date as his birthday. It is a day that will always be special for our family. Thank you all for your e-mails, comments, prayers and well wishes! I went to The New York Botanical Garden ninth annual orchid show this weekend. This year's show theme "The Orchid Show: On Broadway," was designed by Tony award-winning set designer Scott Pask and image-maker Drew Hodges, and takes place in the dramatic galleries of the landmark Enid A. Haupt Conservatory. 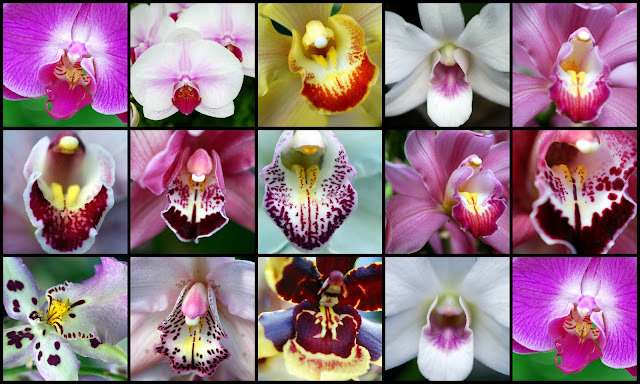 The "Orchid Show: On Broadway" showcases 5,000 dazzling specimens of orchids from one of the most distinguished orchid collections in the world. Over 300 types of orchids are displayed in dramatic curtains, arcades, and chandeliers, all under the domes of America's largest glass greenhouse. The orchid displays were spectacular! One was more exquisite than the next. This giant orchid chandelier was inspired by the original that hung in the Eltinge Theater on 42 Street in Manhattan, once a famous venue for the comedy team Abbott and Costello. 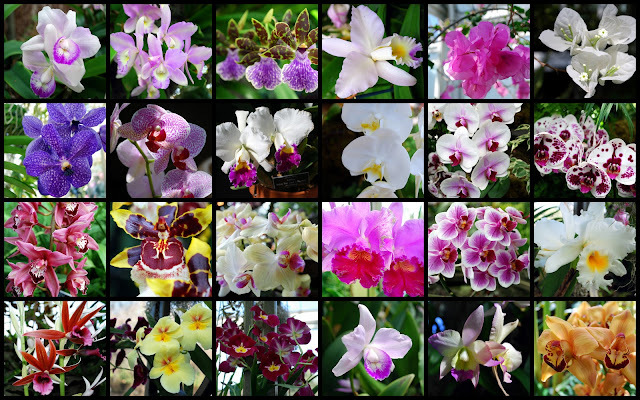 There were so many wondrous orchids that making a photo collage of them seemed the best way to show almost all of them to you. Click on all photos once, and then again when they reopen, to see more details. Some macro close ups of the orchids. Click to enlarge to read this informational placard about orchids. Broadway tunes were playing in some of the greenhouse's galleries which added to the festivity of the exhibit. 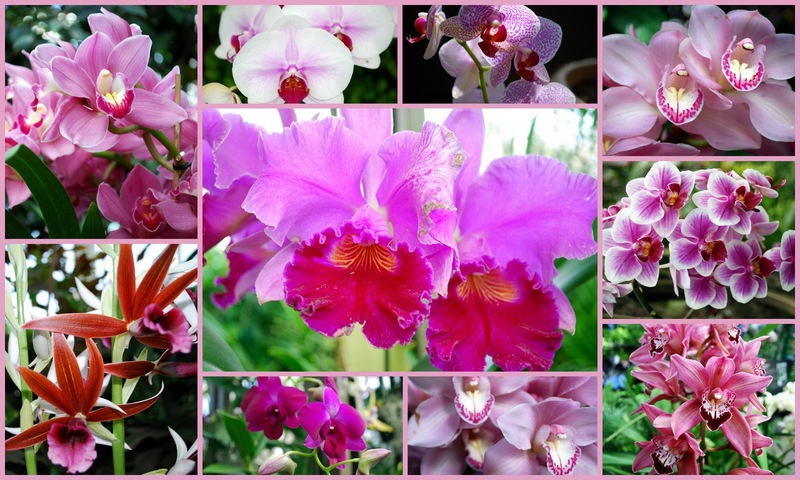 It was a magical feeling to be surrounded by such exotic and fragrant orchids as far as the eye could see! “The Orchid Show: On Broadway” remains on display through April 25, 2011. The New York Botanical Garden is located at 2900 Southern Boulevard, Bronx, New York. 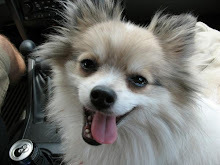 PS: We are still waiting for news of our newest grandson. His brother was born nine days after his due date, so it seems the younger brother wants to do the same! My daughter-in-law is more than ready to go, but it seems babies don't read calendars. Thank you all for your wonderful comments and support! I'll be back with the good news as soon as we hear! Adding this post to Mary's Mosaic Monday on her blog Little Red House! Thanks, Mary! Be sure to look at Mary's beautiful mosaic and all the links on her page to participating blogs. Hop On and Off with me in Sydney, AU! I'm back from Sydney, Australia!